Your letter came and I knew you were sick or you would have written. I am very sorry you were sick and away from home. I know you were not taken care of. Come home and stay. I know I can make a living for you and I will send you money to come. Had a letter from Buddie. He is doing well at last and I am glad he is. I wrote you in reference to selling the mules, cow, bees and a few other things and now I think I will sell to any one who will pay the most. I have been offered $125 for the cow and 50 dollars for the wagon and I will sell as best I can. I bought 3 mules. Big ones for $400. Old Jack is 25 years old and he ought to be pensioned. We have out 52 bales cotton here at Hancock and nine in N.M. We want to get moved right away before cold weather. We are not going to buy another place with what money we make this year. We will put up a windmill and cistern and have water in the house and build a ceptic tank & fix up a bathroom complete with closet. Josie is saving her money to put Lenolium on some of her room and buy a rug. That house has been finished nice but it is now in bad repair. Well I hope you will decide to come home. 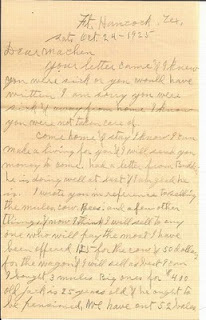 2) This isn't the only letter in which Melvin suggested to my grandmother that she return home. My grandmother had moved to St. Louis from Texas in 1920, at the age of 20. She remained in St. Louis. 3) Josie (nee Thetford) is Melvin's second wife. His first wife, Margaret (nee Denyer), passed away in 1923. At this point in time Melvin and Josie have farm in both Garfield, NM, and Fort Hancock, Texas. 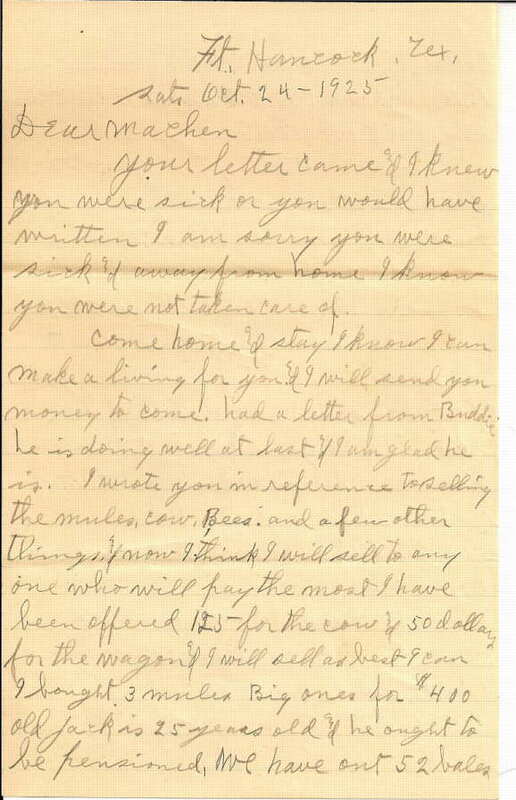 4) I'm unsure who Buddie is in this letter.